A higher offset sits further in... and a lower offset pokes more. Thought I put that on the guide? and no, I specifically mentioned 10"'s not being worth the effort on the back without pulling the arches. And the 9j front would catch the strut. I just wanted to make sure I had it right before conmiting to buy a set of alloys. If I run 8.5 x 18" fronts with 225/40 and 9.5 x 18" rears with 235/40, lowered on eibach springs, am I likely to run into problems? 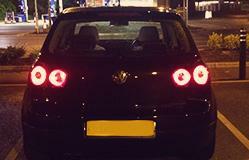 VW Lupo1.4l : Automatic : White : Stickers. Hi all, just recently register here ... Was in the Mk4 game for previous 2 years and time for a change... dont have a MK5 bought yet.. but looking at the possibilities for fitting my current wheels over.. Absolutely no way you will get those to fit. Plenty of buyers and wheels out there to probably sell them and then buy some correct PCD ones without much extra cost. you can have those at like et35. hopefully the idea of my guide was to give you enough information to be able to calculate these things yourself now. Looking at these, what shaft length do I need, the 3 options are 26.7, 34.5 and 41.0mm. No spacers or anything, I'm not cool enough to need those... 26.7mm it is then. Cheers mate! Would these be ok with no rubbing problems?? Ive recently joined the forum and am currently on the look out for my first vw. Currently an e46 driver but previous owner Clio 172's and lots of MX5's in various states of tune. As i skim through the pages im learning as i go but thought id start out by trying to clarify something from the initial post. Apologies if its already been covered. See quote - "However if you wanted to put, let's say.. 18x8.5 et 45, not only is the wheel itself one inch wider, but it sits 6mm further out. So the outer lip of the wheel will sit approx 31mm further out from where a standard Monza 2." This doesnt seem quite right to me and may mislead others. Yes the wheel is an inch wider... but its half an inch wider in both directions.. so surely it would be half an inch plus the 6mm increase in offset wider (so 18.5mm wider rather than the 31mm quoted. We are working off centre lines so we dont add an inch to but sides? My plan is to run 3sdm 0.05 at 18x8.5 on the front. ET42. This will result in around 21.5mm extra poke and 3.5mm extra inset. Hello again everyone. Excellent site!